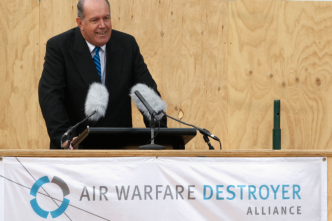 I recently took a look at the ANAO’s audit of the Air Warfare Destroyer (AWD) program. The report is a solid read at 320 pages, but should be required reading for anyone making decisions about the future submarine. And there should be a test afterwards. The first, and most important lesson is the need for design stability—and for the design to be in a form readily digestible by those who need to turn it into hardware. A great many of the problems experienced in the AWD build have been due to either changes in design details, or the difficulty of translating the design drawings into concrete production activities. 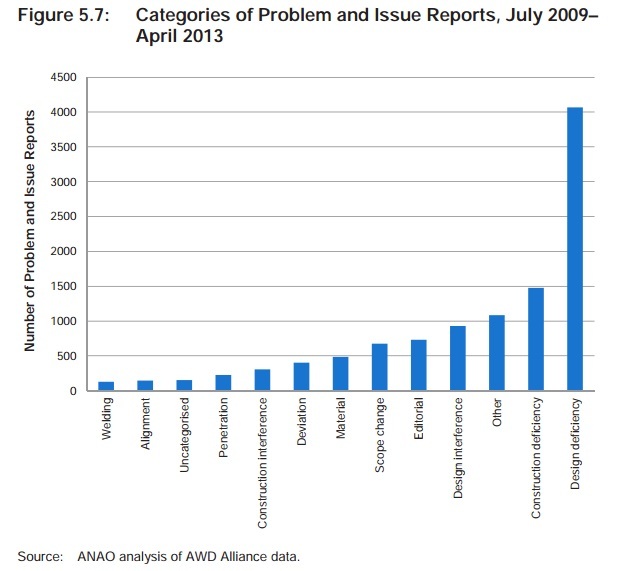 The ANAO’s figure 5.7 (reproduced below) shows the number of entries in the project’s ‘problems and issue reports’ database by category. Nearly half the records related to design issues. The fault for those problems shouldn’t be laid solely at the feet of Navantia as the design house, although there have been attempts to do so. But it’s worth understanding what went wrong. 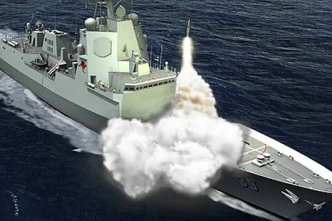 Part of the problem is that this is the first time that Navantia has exported a design. They’re used to preparing drawings for its own workforce in its shipyards at Cádiz—a workforce familiar with both the design philosophy and the technical drawing equivalent of ‘shorthand’ employed and, more importantly, the tacit knowledge of ship production assumed by the designers. 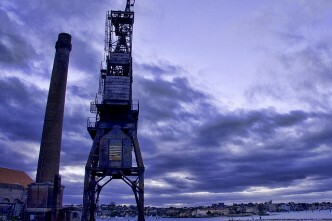 An inexperienced Australian workforce struggled to translate them into executable work. This problem reflects the lack of a shared understanding of design and build approaches—an issue that should’ve been identified during the long and costly analysis that lead to the selection of the Navantia design (of which the shipbuilder ASC was a party). … the poor build quality was largely the result of BAE Systems not having sufficient experienced production supervisors—workshop engineers and foremen—despite being one of Australia’s most experienced shipbuilding organisations. BAE were having none of it, there were again attempts to lay the blame at Navantia’s feet, and we were treated to the unedifying spectacle of ASC and the DMO arguing the toss with BAE in the press. The ANAO makes it clear that there’s plenty of blame to go around. Now all this might be OK if it was behind us, but it looks far too much like a taste of things to come. The future submarine project will face all of these problems and more. In the case of the AWD, we started a build with a first-time shipbuilder and an inexperienced workforce. Seven years on, productivity remains well behind planned levels and even further behind industry standards for an experienced yard—the result of a combination of overoptimistic planning and ineffective production management. That’s despite the benefit of starting with a design that was pretty well understood, with a similar vessel already in production in Spain. The future submarine won’t be like that. If it’s to come anywhere near the articulated requirements, it won’t have much in common with boats elsewhere. If we stick with the expected European conventional submarine technology and an American combat system and weapons, we’ll have to import design elements from more than one supplier. In short, we’ll be starting a harder journey from no better a starting point than the AWD. That’s not an insurmountable problem. Given time and resources, we could pick our way through the challenges, hire the experienced people needed to manage the project and do the due diligence required to stabilise requirements and, subsequently, the design. It’s having the time that’s likely to be the issue; much of the discussion about Australian naval shipbuilding has focussed on the so-called ‘valley of death’ facing the blue collar workforce as AWD work winds down. And that is a problem—workforce productivity takes time to build up to best practice standards. But we need to be careful not to embrace costly ‘make work’ projects with cost premiums that exceed the savings which continuity of work might deliver via higher productivity. I’d argue that much more important at this stage is managing and harnessing the skills required at the white collar end of the process—the engineers, designers and production managers who have to sign off that the chosen submarine design is fit for purpose and ready for production. I fear that we’re already at the wrong end of the valley for many of those skills as the design work for the AWD recedes into the past. 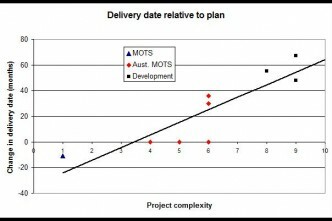 The ANAO estimates that the overall productivity in the AWD build is such that it’s costing $1.60 for every planned $1 worth of work. Their report suggests that a lot of that is to do with design and production issues, not just fabrication. ensure that we have a stable and suitably documented design, and resist the urge to get to the metal fabrication stage as soon as possible as a means of providing shipyard jobs.